Its increased throughput performance and low host-CPU utilization are achieved through functions such as flow control support, 64-bit address support for systems using more than 4GB of physical memory; and stateless offloads such as TCP, UDP and IPv4 checksum offloading, enabling your computer to perform better while large files transfers or high I/O operations take place. Wake-on-LAN support enables remotely waking your computer when you need it, and not wasting energy when you don’t. 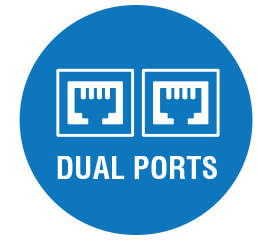 With its dual ports, this Sonnet adapter supports transparent failover to keep your computer connected in case a single cable is disconnected or one of the ports fails, and it also supports link aggregation (teaming)(1) for increased throughput! Switch/router must support link aggregation (teaming) and ports must be configured for link aggregation. Windows 10 teaming requires Creator's update, version 1703 or greater. Package includes both low-profile and full-height mounting brackets.